Part 1 - What Is Truth? 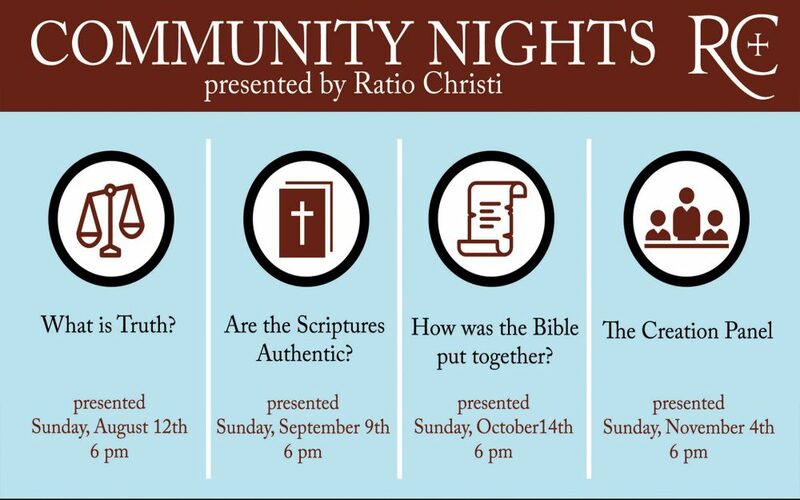 Ratio Christi Community Nights are for people of any background, faith, or worldview to gather and investigate the claims of Christianity. Each night we’ll wrestle with a challenging issue, hear from experts in the field, and have open Q&A. If you have questions about why Christians believe what they do, want to examine the intellectual veracity of Christianity, or hope to strengthen your own faith through better understanding — this is for you. Doubts, skepticism, and direct questions are all welcome! Ratio Christi (Latin for ‘The Reason of Christ’) is a global movement that equips university students and faculty to give historical, philosophical, and scientific reasons for following Jesus Christ. Students learn to defend God’s existence, the reliability of the Bible, and the fact of Christ’s resurrection.